So, taking all that information into account, let’s take a look at ten great fish finders and see if we can find one to perfectly suit your needs. Purchasing of a fish finder may just be the best investment into your hobby that you’ll ever make, so now that you have the information to make an informed choice, let’s dive right into looking at some different units. Additional Features: App that includes maps, weather, fish calendar activity and more. Deeper DP0H10S10-P is an innovative fish finder to be certain and may just be the absolute best buy for those who like to do their angling from rocks and piers. The Bluetooth signal can be read from up to 150 feet away and the useful and functional app that comes with it lets you access the readings directly from your smartphone. 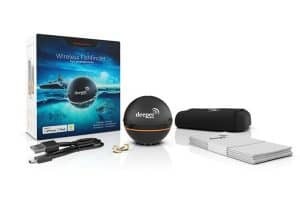 This isn’t a great device for trying to map the ocean or even the local lake, but if you find yourself most at home on piers and rocks you’ll find the Deeper Wireless Fish Finder almost indispensable. The app has a wide array of information options as well to make life easier for nearly any angler. The battery will last for nearly six hours of constant use, and the creative angler will be able to get great readings in spots you’d normally never think of using a fish finder in. The device itself is about the size of a tennis ball, so it will easily fit into your tackle box when you find out exactly how much easier it will make your angling adventures. 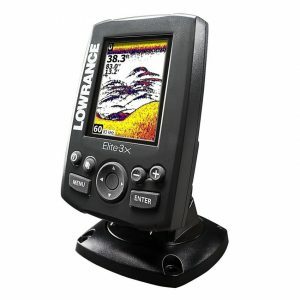 The Lowrance Elite-3X is a great bargain fish finder for those who are just tipping their toes into vessel-mounted finders. It has most of the standard features, but its real claim to fame is that it really is the cheapest, quality fish finder in the game. It also makes for an attractive feature with its colorful 320×240 resolution display. The screen itself is great for the cheap price. It features a backlight, a good resolution, and color which are all great. One of the coolest things here though is that you can switch between the high and low frequencies with the push of a single button, making it convenient when you need to switch from high to low frequencies as you go through your day. This is a great introductory buy for those unfamiliar with this, and it’s primarily suitable for freshwater use. It’s not the biggest, toughest, smartest finder in town and you won’t be finding Atlantis with it but it’s a cheap, highly functional piece that’s sure to make sure you have a great introduction to using one of these highly valuable sonar devices. It also has a function which attempts to automatically make the settings as clear as possible, making for less intervention with the device and fooling with settings. It’s easy to mount and use, and an amazing bargain for the price. 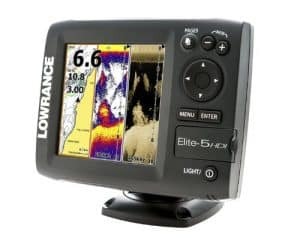 Now we’re talking, Lowrance Elite-5 HDI is a great fish finder for a wide range of purposes and it comes with a few nifty features to make it a stand-out. The great quality definitely matches the price in this case, and you’ll absolutely love the waypoint features. This great fish finder will reach a maximum depth of almost 2,500 feet in its lower frequency mode, and the finder itself is loaded with an array of useful features both to help you find your way, and to help you find your way back once you’ve found that perfect spot. And with its 480×480 pixel display you’re sure not to miss a single vital detail. It has an easy to use the menu system to allow you to access its bevy of features, and great technology to keep you from having to manually adjust your screen any more than necessary. It also boasts two different modes of viewing, Broadband which is perfect for judging your lure action and fish arches as well as Downscan which will provide you with an easily read view of the water and floor beneath your boat. If you’re primarily a lake or coastal fisherman, this is a great option to add to your bag of angling tricks. 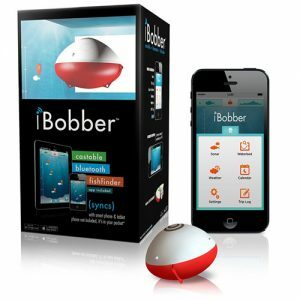 This is another smart fishfinder with a great app. It comes in a bit cheaper than the Deeper Smart Fish Finder but boasts much of the same functionality. You’ll quickly find this device is a great little tool to add to your equipment, and it comes in at a relatively low price. The single band sonar on this fish finder can be a bit of a drawback, and its limited range makes it suitable only for angling in shallower water. These drawbacks still leave it perfect for a variety of uses, however, and it lasts a good eight hours per charge so you can keep fishing all day. What this device does offer though is the fact that it is simple and easy to use, and with a range of 100 feet, it’s sure to keep in range for all but the greatest of casters. The app is relatively simple, and will quickly and easily show you the information you’re looking for but it’s not the most detailed smart sonar device on the market. However, it’s definitely worth a shot with such a small investment. The Humminbird ICE-55 does pretty much what it reads on the label. This is a great fishfinder for ice fishing, designed specifically for that purpose. Because of its designated purpose, it may lack some of the features of a vessel-mounted finder, but you’ll find it’s an absolutely fantastic buy if you like fishing frozen lakes. The high frequency and decent wattage will give you a crystal clear picture down to about 200 feet and the entire unit is made to withstand extremely low temperatures so you won’t have to worry about a bit of frost destroying its valuable innards. This finder has a particularly narrow arc due to its high frequency, but without the fancy displays of some of the others, this might be an advantage for ice fishing. You’ll find that it lets you know exactly how deep the fish are and you can drop to exactly the depth you need so you can fill your bucket quickly. Despite its lack of advanced features, you’ll find that the Humminbird ICE-55 is a great buy if you’re going to be fishing under the ice. Once you have it in your hands, you’ll eliminate much of the guesswork that comes with fishing an unseen surface, and be able to ensure yourself a bountiful harvest of delicious fish. 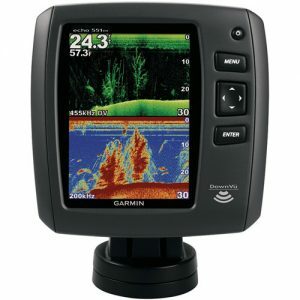 The Humminbird Helix 5 is a great unit. The main thing to set it apart here is the fact that at any given time it will be running both a narrow and a wide sonar cone. With the split screen features, you’ll be able to get both the resolution of the higher frequency in a limited area and the wide view afforded to you by the lower frequency. Not that the lower end of 200 kHz is all that blurry to begin with. In the event that you decide to equip your boat with this unit, you’re sure not to be disappointed. It boasts quite a few features and the dual frequency sonar emitted gives you exactly the view you’ll need to find your prey. The sonar cones get remarkably large with the lower frequencies, a full 75° in the 200 kHz range, and the extremely high 800 kHz function will take advantage of the high screen resolution of the unit. Another great feature you’ll find a use for is the micro-SD slot which will allow you to save your waypoints for different areas on different cards, and since this unit is viable for so many different types of fishing this is a great way to take advantage of that fact. It comes in at an amazing price for its high-tech features, and you won’t regret going with this as the primary choice for your boat. The Garmin Echo 551dv is a great dual-band finder which works down to about 2300 feet. It also features dual screens so you’ll be able to read both signals simultaneously. It’s definitely a no-frills finder which you’ll find especially useful for lake or near coastal fishing. It comes with a color screen in high resolution, so you’ll be able to quickly locate fish and their hiding places by using this device. The device is also highly user-friendly, with menus easily accessed via a few buttons to the side of the fish finder screen. This finder also has a down view option, as well as the standard 2-D, allowing for multiple ways to view the lake bottom and decide on the optimal way to cast. The 500W means it will return a signal quickly in most freshwater situations as well, making for even less guess work on your angling adventure. For the fisherman on a budget who wants a fish finder with just a great sonar unit, the Echo 551dv has a lot to offer. It may be light on side features, but you’ll find that it functions exactly like you want and offers a great view, making this a solid fish finder for the price. Yet another great offering from Humminbird, this great dual-band device is sure to make the cut for those looking for a great fish finder. It comes equipped with a GPS and charting software, although this older unit doesn’t allow for software upgrades. 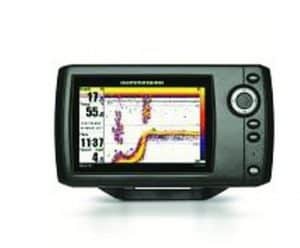 The built-in Humminbird software offers quite a number of features including waypoints and the ability to zoom in a separate window on the screen. The screen itself is full color and high resolution so you’ll be able to see all but the smallest things in the water beneath you. You’ll find that you can even watch your jigs in the real-time view. This model has been discontinued, however, so if you think the low price and great features will meet your needs for the time being you might just want to jump on it before they’re all sold. 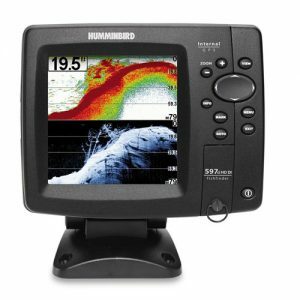 The Humminbird 597ci is an absolute bargain, and yet another great fish finder from Humminbird to consider adding to your list of equipment. 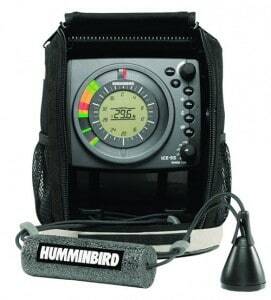 This is a portable fish finder suitable for almost anywhere. You can use it from the dock or a pier, and it’s easy to read and simple LCD display will give you a good approximation of where to go with your tackle. It’s an old-school LCD featured here, black and white with minimal sharp readings but if you’re just in the market for something to give you approximate readings for a ridiculously good price this may be the finder for you. It reads around 100 feet deep in the water and is easily portable. It uses a “broomstick” type transducer you can drop in the water. Once it’s in all you need to do is power on the display and you’ll quickly have a good idea of how deep and far you need to cast since it produces a pretty good 45° arc from its 200 kHz transducer. It’s not the toughest unit out there, and probably isn’t suitable for aspiring professionals. It is however pretty much perfect for the casual fisher out for the weekend, and that’s definitely the niche it’s marketed to. If you want a simple device for an extraordinary price, you’ll definitely want to consider this portable unit. The Garmin Echo 301dv is another value-priced unit with big power. You’ll be glad to know that it can penetrate the depths to as much as 1,750 feet and with its high resolution, full-color screen it comes in at a great price. This is simply a superb mid-range unit, it’s definitely a pragmatic choice for the fisherman who wants a good, clean unit for their vessel on a budget. With its 3.5” color display you’ll easily be able to make sense of the readings and use that knowledge to your advantage. This is probably a good unit for the dedicated lake fisherman, particularly if they already know their stomping grounds well and might not need to mark all the best places with a GPS waypoint system. With its quick and easy install, you’ll be able to get out on the water quite rapidly and get things going on your fishing trek. 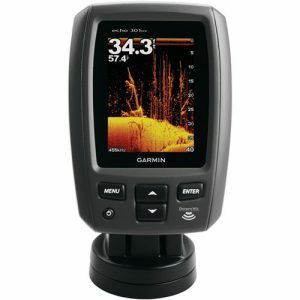 This isn’t the most advanced unit, but it’s definitely a great one if you’re on a budget and want a color finder with pretty impressive depth readings for your boat. As you can see, choosing a fish finder really isn’t all that complicated. Once you take into account your needs you’ll find that there’s a wide range of options to accommodate anyone from the casual weekend lake fisherman to the professional marine angler. If you know what you’re going for, it makes the selection that much easier, and you might quickly find that a fish finder is exactly what’s been missing from your beloved set of angling tools. 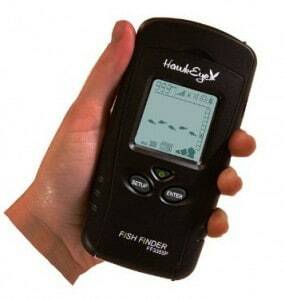 If you’re seriously into angling, you’ve probably looked into getting a fish finder at some point. Perhaps you even bought one or two and weren’t satisfied with your purchase. The process of finding the one you need is actually relatively simple as you’ll soon see, and we’ll suggest a range of products which is sure to meet almost any fisherman’s needs. Selecting your fish finder might seem like a major task, but you’ll quickly find out that this doesn’t need to be the case. You can actually determine what you need from the complicated looking specifications on a model pretty easily. The frequency used by fish finders can have a pretty wide range. What you’ll need to know is that lower frequencies generally operate deeper and with less resolution, while higher ones will bring things into razor focus but might not penetrate as deeply. Most modern fish finders operate in more than one frequency, quite often a high/low to better be able to suit your purposes at the given moment. The arc that your fish finder transmits in is another important consideration for the first time buyer. The device’s arc will be measured in degrees, and many devices will have different arcs for different frequencies. In almost all cases the lower kHz signal will have a much wider arc and the higher signal will have a narrower one. This quality is also commonly referred to as the cone angle of the finder. The wattage rating of your fish finder determines the power put in behind the signal, and since they generally put out a constant amount of power you can easily see why lower frequency signals reach farther. They simply require less energy to send out. The general rule of thumb is that 100W will be equal to about 400 feet at 50kHz or 100 feet at 200kHz. This is a crucial consideration for your purpose, those fishing in shallows can get away with a much less powerful signal than those who want a device for use in the open ocean. Depending on your needs, you’ll also want to look into what type of transducer your device utilizes. Most fish finders come with a transom mount for underneath your vessel, but more advanced models might be thru-hull. There are even modern “smart” fish finders which are single devices which you can either cast or throw out and receive the signal’s reading on your phone or tablet. These latter types are especially handy for those who might fish from piers, rocks, or the shoreline. One other thing to keep in mind is that quite often modern fish finders will come with a range of features other than just their sonar capability. Some of these can be almost indispensable, look for units that have a GPS and temperature gauge at the least. You’ll also find that a gauge for your speed is of immense benefit for some varieties of fish. Now comes the fun part, we’ll try to keep in mind all of these aspects in order to guarantee you can find the correct sonar device to suit your needs. For those fishing from shore, your options were pretty much nil until the last few years and the release of amazingly innovative smart devices which will send readings to your phone. If you spend most of your time outside of a boat, this new technology is definitely what you’ll want to be looking for and it’s hard to go wrong since most of the time you’ll be working in fairly shallow water. It’ll primarily depend on whether you want one to cast out with your line or something you’ll be deploying independently. Freshwater fishermen will probably want high wattage and very high frequencies. The main reasoning behind this is that a higher wattage unit will return readings more quickly than less powerful units. The faster readings will give you a more accurate idea of where your prey is located, and you’ll quickly be able to account for any margin of time lost between signals returning. As with anywhere else, you’ll be fishing, speed, and temperature gauges are a great thing but unless you’re fishing on the Great Lakes you’ll find that a GPS unit isn’t quite as essential here. It should still be in consideration, though, as many fish finders will allow you to mark spots with a waypoint system, and you can keep anywhere the action is hot saved for your next excursion. Saltwater fishing, on the other hand, will benefit more from their lower frequency settings. You’ll want a wide cone arc and a lot of power to get you down deep, if not to the actual bottom depending on where you’ll be angling. GPS units are almost essential for marine fishing, the oceans are massive after all and you’ll be able to come back to your spots each and every time. You’ll also need higher wattage here, as high as your boat’s system can handle really. The density of salt water removes some of the penetrating power of the sonar, and for most applications you’ll want to be able to “see” as deep as possible. Another important consideration for all types is to pick a type of display which you find pleasing. Some of the old black and white fish finders seem archaic and hard to use compared to modern displays, and while it may seem like merely an aesthetic affectation to have a find with an HD screen, the higher resolution will allow for much greater accuracy and detail in your readings. Great post about best fish finders available on the market. It is very helpful for a beginner like me. After reading this article, I have decided to pick Garmin Echo551from your list. What do you say about my choice? Thanks for sharing.